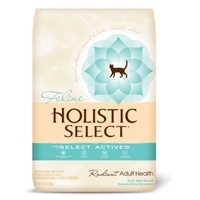 Holistic Select Radiant Adult Health Cat Duck Meal Recipe 12 lb. When developing our Holistic Select® Feline Radiant Adult Health Recipe, the equation for health is simple. We start with premium proteins, wholesome grains and healthy fat sources. We then combine them with our unique Select Actives™ plus additional benefits to create a final recipe that delivers optimum natural nutrition for daily whole-body health.